John Terry has hit back at criticism over his controversial celebrations during the defender’s last ever game for Chelsea at Stamford Bridge, insisting that he ‘couldn’t care less’ what people think. Terry arranged to be substituted after 26 minutes of Chelsea’s last game of the season against Sunderland, who had agreed before kick-off to put the ball out of play at the agreed time. 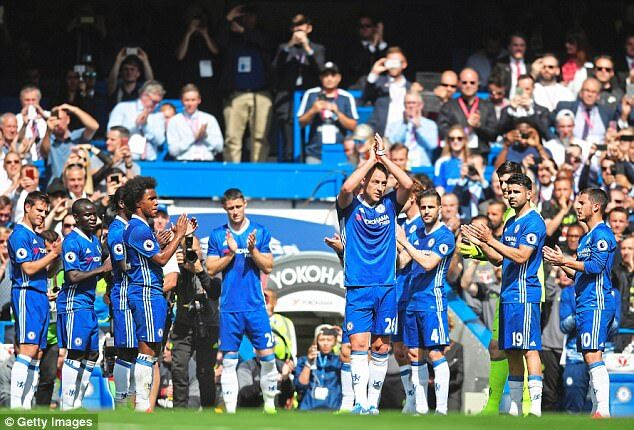 The fact that Terry had arranged to be substituted during the game and disrupted the fixture caused anger among some fans – but the 36-year-old said that the reaction hasn’t affected him. ‘I couldn’t care less, I promise you,’ he said. ‘All I care about is celebrating with my Chelsea fans. Me and them have a wonderful rapport and have done for 22 years. Nothing that people write or say can ever get in the way of that. ‘If that’s the way I want to go out, that’s the way I go out because I’ve been here 22 years, I’ve won so many trophies — so if I wanted to play one minute and come off, I would have done. Terry is likely to be on the bench for Saturday’s FA Cup final against Arsenal, with Antonio Conte returning to his first-choice back three of Gary Cahill, David Luiz and Cesar Azpilicueta.